Holotype of Qiliania graffini from Ji et al. in press. After a failed attempt or two to convince a Chinese co-author to let me name a new species after my favorite rock star, I found myself helping Jessie Atterholt with a project on a new enantiornithine from the Early Cretaceous Xiagou Formation near Changma in Gansu Province, China (the locality is famous for its dozens of Gansus specimens preserved in 3D with skin impressions; Science 314: 1640). Turns out Jessie is a big Bad Religion fan too, as were our other co-authors, Dr.’s Jerry Harris and Matt Lamanna, and so, with no objections from our Chinese co-authors (who were like, who? ), we decided to name the new taxon Qiliania graffini. 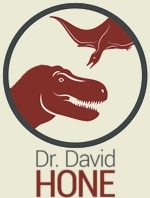 The new specimen is represented by a nearly complete left hindlimb and pelvic girdle preserved in a slab (FRDC-05-CM-006; holotype), and a right hindlimb (FRDC-04-CM-006) prepped free of the matrix – although its ‘just another species of enantiornithine,’ the amazing 3D preservation of the Xiagou Formation allows us to discern morphological details, such as the presence of groove for the insertions of the extensor retinaculum on the distal tibiotarsus of Qiliania, unavailable in most Jehol specimens. The specimen indicates that the ilioschiadic fenestra in basal enantiornithines was closed distally (could not be discerned unequivocally in Jehol enantiornithines) but the dorsal process of the ischium was not fused to the ilium (as it is in the only known Late Cretaceous enantiornithine pelvic girdle and neornithine birds; Chiappe and Walker, 2002). The tibiotarsus is the most interesting element preserved – proximally it bears a cranially expanded cnemial crest, unknown in any other enantiornithine (poorly developed cnemial crest present in Soroavisaurus). Where hindlimb elements are preserved in basal ornithuromorph taxa (the sister group of enantiornithines and the clade that includes living birds), a well-developed cranial cnemial crest is present – this feature is associated with living aquatic birds and it has been suggested that modern birds survived the K-T extinction living in aquatic refugia. The presence of this feature may suggest that Qiliania was adapted for an aquatic environment, as was Gansus. 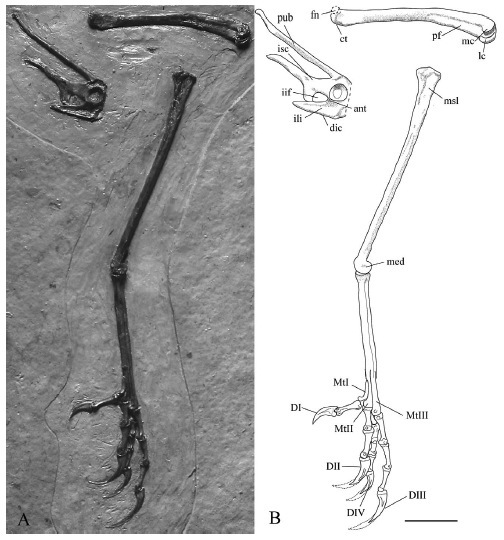 Pedal proportions fail to reveal the ecology of this taxon, suggesting either that Qiliania was a generalist or that ecological specializations in pedal phalangeal proportions among enantiornithines differed from those observed in living taxa. Yes, and it was named by Gregory Paul in 1988.